I’ve mentioned my love of widgets in passing, but thought they deserved a little more attention. If you’ve ever used Apple’s Dashboard, the customizable Google Homepage, the Yahoo! Widget Engine, or Windows Vista’s Gadgets, you’re familiar with the idea. If you haven’t tried any of these, widgets are little, single purpose “applications” (if you can really call them applications) that interact with some kind or remote web service. That interaction could be one-way (pushing you the latest weather information or news on a topic) or two-way (viewing and editing your web-based calendar). The main idea of widgets, as I see it, is to give you quick access to the information that matters to you the most – and only that information. Some give you quick access to a commonly used web app, while others provide “glanceable information”, such as a list of unread emails, current stock prices, or the latest headlines from a favorite site. It’s about you controlling the information coming in instead of being force-fed by someone else. This idea has gained a lot of traction, leading some to proclaim 2007 “The Year of the Widget“. So far, widgets have primarily been contained to computer desktops and websites. A new product on the horizon aims to change that by bringing them to your desk or end table. 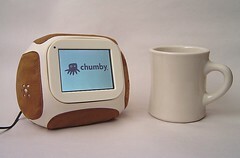 It’s called Chumby, and I want one bad. When it’s available, the Chumby device will use your WiFi connection to download widgets and display them on its own little screen. It can function as a clock, MP3 player, digital photo viewer, stock ticker, calendar, and more. What makes the Chumby really great though, is that the whole deal is open source. Its maker (Chumby Industries) has made the hardware schematics available online, and it runs on slimmed down version of the Linux operating system. You can even easily modify the case to make it look however you’d like. Hacking the Chumby isn’t just acceptable, it’s encouraged. The Chumby is supposed to cost about $150 or less when it comes out, which seems like a pretty good deal. I hope the company does well, and I suspect they will with their wide-open architecture that will attract tons of attention and tweakers. This one will be fun to watch!